Let’s face it: you are caught on security cameras almost every day! Compared with video only monitoring, audio recording without your notice can be more worrisome. So, as you may wonder, do security cameras have audio? Can CCTV security cameras record sound? And how to tell if security cameras have audio? With the above questions in your mind, you’ll get all the inside details by the time you’re done reading this post. If you ask: can security cameras record audio? The answer is definitely YES in terms of the camera technology. In virtue of the built-in microphones that are sensitive enough to pick up the sound within the monitoring zones, the IP cameras are capable to record both audio and videos. For some of the security cameras with audio input, they can also allow you to add an external microphone for sound recording, like the outdoor security camera Reolink RLC-423. There is no doubt that security cameras with audio offer you unparalleled benefits. For example, you can listen to your baby, pets or visitors from afar without physically being there. But an unavoidable fact is that, CCTV cameras with sound recording could infringe on people’s privacy if not used properly. And that leads to the following question we are going to discuss: Can security cameras record sound from the perspective of laws? The audio surveillance laws by state vary from place to place and are generally stricter than video monitoring regulations. And that’s also explains why not all security cameras have audio. To help you learn whether it is illegal to have security cameras with sound in your location, here are a few factors you need to check out. #1. Where are the CCTV cameras with voice recording installed? If the security cameras with audio are placed in your home for security purpose, then without any doubt, your CCTV cameras can record audio legally. When it comes to the places where people have the expectation of privacy, such as the bedrooms, dressing rooms, toilets, etc., both audio and video recording are not allowed. The legality of audio recording in public places can be more complicated and you’ll have to consider other factors (listed below) as well. For Your Reference: Can an employer record audio at the workplace? Read this post to find the answer. #2. Does the subject consent to audio recording? According to the privacy laws in most states, CCTV cameras cannot record sound unless you obtain the consent of at least one party involved in the conversation. In such places as California, Connecticut, Delaware, Florida, Hawaii, Illinois, Kansas, Maryland, Massachusetts, Michigan, Montana, Nevada, New Hampshire, Pennsylvania, Utah, and Washington, all-party consent is required before your security cameras can record sound legally. Also, putting up signs which specify that audio recording is taking place can also be regarded as consent in most states. For example, the small business owners usually would place a sign indicating the use of retail store security cameras. 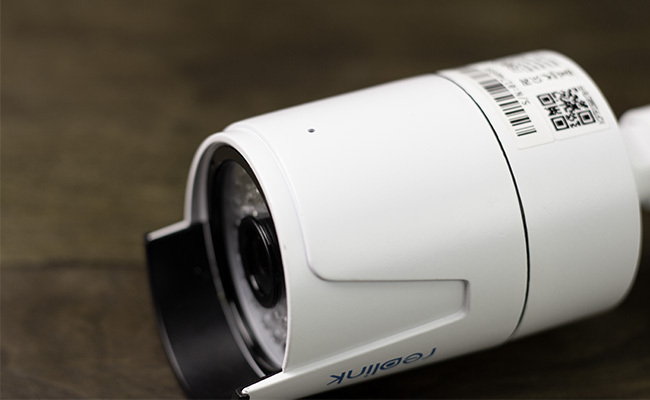 The most reliable way to learn if security cameras can have audio, is to search related local, state, and federal laws or to consult your attorney directly before you have one camera installed. If you notice an IP camera in public places and want to check if this CCTV camera is recording audio, maybe you can only ask the camera owner as the microphones are normally unnoticeable from a distance. However, there are multiple ways available for you to tell if your newly bought CCTV camera has audio. Look through the product page as well as the tech specifications to see if audio recording is listed as a highlight of your security cameras. For the security cameras that have audio or sound recording, generally there is a small hole (microphone) in the camera housing for sound pickup, just like the one in Reolink RLC-410 as showed below. Download a video clip and play back the recorded footage to see if your security cameras do have audio. After all, the quickest way to tell if your home security camera has audio is to inquire the support team of your camera seller. And if you’ve got any experience about how to know if CCTV has audio, please don’t hesitate to share your ideas with us so we can add more helpful tips here. Besides the most frequently asked question that do security cameras have audio, here we’ve collected more hot problems and solutions concerning security camera audio recording. Q1: What’s the Audio Range/Quality of CCTV Cameras? As you can guess, the audio range and quality of security cameras vary with different brands. If you want to buy the CCTV cameras with high quality sound recording, go for the reputable brands that have a large customer base and enjoy high appraisal. The video samples with voice recording can also offer your some reference to judge the audio quality of IP cameras. Taking Reolink security cameras that can record sound for example, the audio range can reach as far as 6 meters with clear voice. And below is a video sample with voice captured by Reolink RLC-410. A car accident was shot by the home security camera with audio Reolink RLC-410. In the video, you can also clearly hear the bird singing and the car crashing. Q2: How to Turn off Audio Recording of Security Cameras? In some situations where you’d like to disable security camera audio recording, you can easily achieve this on your smart phone or PC. 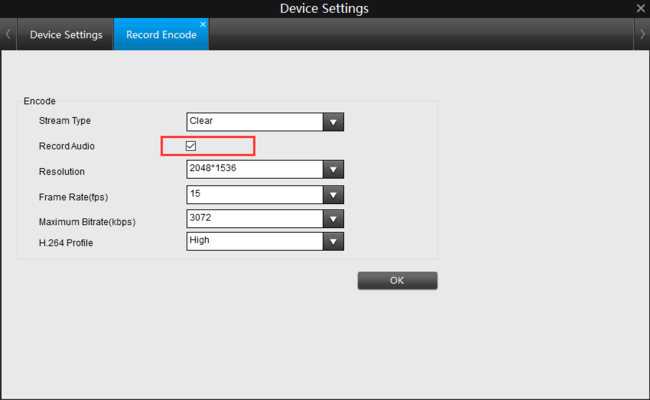 Simply log into the security camera software, and untick the box before “Record Audio” under the camera settings (like Reolink cameras below). ①Quora: Do security cameras have audio? How can I check that this CCTV camera is recording audio? ②The Security Installer: Is it illegal to have microphone/audio on camera/CCTV kit? ③CCTV Forum: Does anyone know if it’s legal in California for audio recording? This entry was posted in Home Security FAQs and tagged laws, record sound, security camera audio, turn off audio. Hi there, yes, in the public places such as your church auditorium where an individual can expect to be seen by others, it is generally acceptable to install CCTV cameras. And you can also post signs indicating that surveillance cameras are in use. But note that security cameras that record sound may raise additional privacy issues. It is best to check your state and local laws about audio recording first and consult an attorney before you use CCTV cameras with audio recording. And if you need any help choose video surveillance cameras, please just feel free to let me know. Please i greet you, i hope you guys are doing well good. Anyway can for my church auditorium?